Daytonian in Manhattan: The 1912 James B. Duke Mansion -- No. 1 E. 78th St. The 1912 James B. Duke Mansion -- No. 1 E. 78th St.
Society eyebrows were raised when the staggeringly-wealthy James Buchanan Duke announced his engagement to the 40-year old widow, Lillian McCredy, in 1904. The couple had known one another only briefly and, while Mrs. McCredy was prominent socially, a marriage so quickly seemed rash. On November 29, 1904 the pair was married. They immediately sailed off for Europe for a honeymoon of several months. The marital bliss would be short-lived. Sensing betrayal, Duke hired private investigators to follow both his wife and Huntoon. The investigations produced the undeniable evidence of an affair and Duke sued his wife for divorce. The two-timing Lillian received $500,000 settlement—a paltry sum when Duke’s fortune was estimated to be approximately $60 million at the time. Negotiations for the property stalled, however, perhaps because Cook’s Victorian pile was decidedly out of date. Finally in August 1909 Duke purchased the property for $1.25 million. Although he initially hired C. P. H. Gilbert to remodel the hulking mansion; he soon changed his mind. Instead he decided to demolish it and start over. He commissioned Philadelphia-based architect Horace Trumbauer to design a new, up-to-date mansion on the site. Trumbauer estimated the cost of the new structure at $1 million. 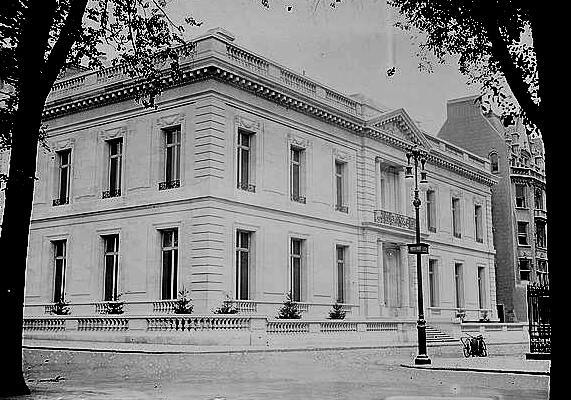 “From these figures it is evident that the new home of the tobacco magnate is to be one of the most magnificent of the famous group of residences along the easterly side of Central Park,” remarked The Times. Trumbauer was not widely accepted by New York architects who disapproved of his "stealing" designs from historic properties. For the Duke mansion he did just that; nearly reproducing the Hotel Lobottiere in Bordeaux, France. The changes that he made, while subtle, resulted in a architecturally-effective residential building on a New York City street. Architectural historians are generally in agreement that it was not Trumbauer, solely, who was responsible for the Duke mansion; and that his head designer, the African-American Julian Abele, was possibly highly influential. Abele was most often overlooked during his lifetime and received little credit for his remarkable designs until later in the century. Completed in 1912, the Duke house stood apart from most of its neighbors by being free-standing. A stone balustrade wall separated the shallow lawn from the sidewalk, nearly matched by a similar treatment at the roofline. The Dukes moved into the house that year with their baby girl, Doris. The museum-worthy interiors were sumptuous; filled with the antiques and artwork collected by Duke himself. The bulk of the furniture was Louis XV and Louis XVI period and antique tapestries decorated room after room. Along the second floor hallway were two Regence tapestries valued at $10,000 and a Gobelin tapestry, “Le Memorable Judgment de Sancho,” assessed at over three times that much. Another Regence tapestry hung in the dining room along with a fourfold Bavonnieres tapestry screen. Other tapestries included early sixteenth century Flemish, French Renaissance and Gothic examples. Among the priceless artworks were a terra cotta bust by Houdon, “Second Daughter of the Artist,” in the library; Gainsborough’s “Lord Gwydyr” and Raeburn’s “Gentleman in Red Coat” in the main hallway. The Dukes entertained lavishly. Here in March 1913 they gave a dinner for 60, followed by a musicale. Lucrezia Bori and Pasqale Amto of the Metropolitan Opera entertained, as did violinist Efram Zimbalist, according to The Sun. 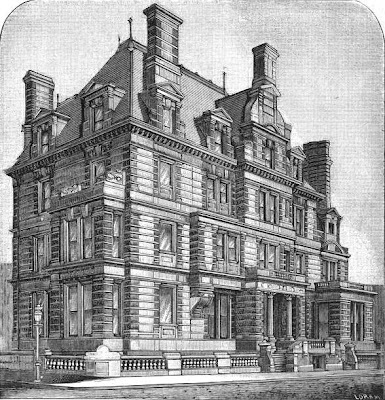 The mansion on East 78th Street was convenient for business and city entertaining; but it was not the Dukes’ main residence. Across the river in Somerville, New Jersey was their 2,500-acre country estate which James Duke listed as his primary residence. In the Summer they spent time at a former Vanderbilt “cottage,” Rough Point,” and another magnificent mansion in Durham, North Carolina often served as a getaway in the Winter. In March 1925 James Duke’s first wife, Lillian, reappeared. She had lost the money left to her by her wealthy first husband as well as the half-million divorce settlement. Lillian had studied singing under Jean DeReszke in her happier days and was now subsisting by giving music lessons. She now sought to recover some of the millions she lost through her indiscretions. Over two decades after the divorce she filed suit to set the divorce aside and declare her the legal wife of James B. Duke. She protested in court that “perjured testimony was given against her.” On May 15 Justice Giegerich dismissed her complaint and upheld the divorce, as well as Duke’s marriage to Nanadine. Lillian had her attorneys set in motion an appeal of the decision. The appeal would never make it to the courts. James Duke contracted pneumonia and died in the house on East 78th Street on October 10. Lillian, who was living in her music studio, was plunged into deep depression upon receiving news of his death. Refusing to eat, she became weak, and then suffered a cerebral hemorrhage. Within weeks of Duke’s death she died nearly penniless. James B. Duke’s estate was estimated at between $60 and $100 million dollars. $40 million went to Trinity College in Durham under the condition that the name be changed to Duke University. The bulk of the remaining estate went to Nanadine and little Doris. Although the will gave Nanadine life rights to the Newport, North Carolina and New York City mansions; it also said in another clause that the executors must sell all real estate immediately. Doris was permitted by the terms of the will to purchase the properties back, and the executors were to provide her with the sufficient funds to do so. Doris’ suit claimed the auction would be a “vain and useless proceeding” since she would end up with the properties anyway. She also was concerned about a public auction. “She asserts that if the property is advertised for sale the residence in New York will be opened to the public, and persons claiming to be prospective purchasers will go there with the result that the property will depreciate in value,” said The Times. No doubt Doris and her mother were not eager to have riff-raff tromping through their home. In the end young Doris inherited the vast real estate holdings and, as her father directed, her mother had the right to use them for life. Now known as “the richest girl in the world,” Doris Duke was determined to live her life by her own rules, despite what conventional society thought. Four years later her debutante ball was given at Rough Point by her mother. 600 guests were invited who danced to the music of two orchestras in the ballroom. Doris Duke had arrived. 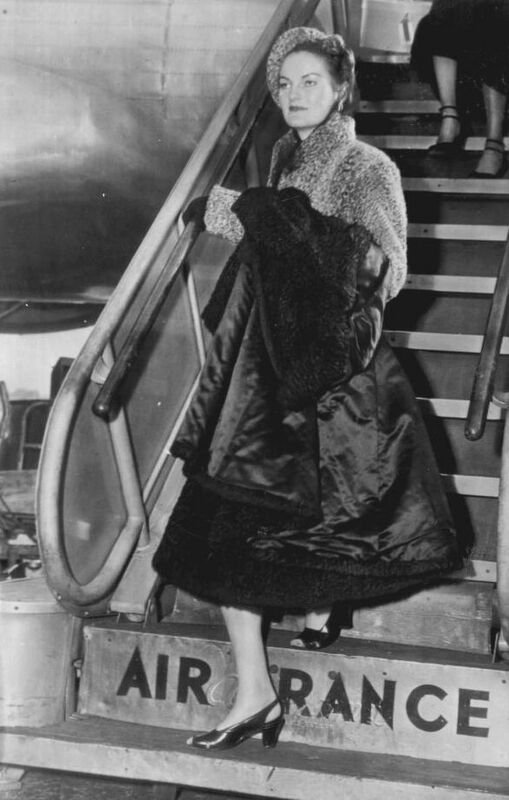 In 1933 she quietly celebrated her 21st birthday; a landmark date that increased her fortune by about $30 million. The gang of journalists crowding East 78th Street prompted her to leave the city to seek the calm of Duke Farms outside of Somerville, New Jersey—which by now encompassed 5,000-acres. Here she admitted a handful of reporters who asked her about her increased wealth. “I really don’t know myself how much there is,” she said. Doris Duke traveled the globe delving into exotic art, historic preservation, and—generations ahead of her time--wildlife and environmental conservation. She became one of the first American collectors to discover Southeast Asian and Islamic art and filled her homes with diverse objects d’art. Twice married and twice divorced, she explored areas which were still mysterious in her day: Africa, India, the Near East and Southeast Asia. During the Second World War she earned a salary of one dollar a year working in a canteen for sailors in Egypt. She briefly served as a foreign correspondence for the International News Service in 1945; then took up residency in Paris to write for Harper’s Bazaar. Later, while living in Hawaii, she added to her list of accomplishments being the first female competitive surfer. On January 7, 1958 The Times reported that the 40,000 square-foot mansion at No. 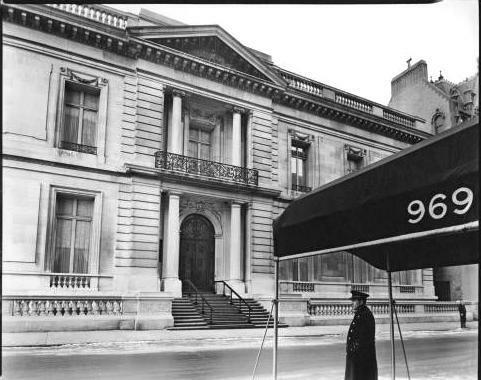 1 East 78th Street was now the property of New York University’s Institute of Fine Arts. “The three-story limestone building that will house the graduate study institute is a gift from Mrs. Nanaline H. Duke, widow of Mr. Duke, and their daughter Doris Duke,” the article said. The Institute’s care in sympathetically renovating the beautiful home earned it a New York Landmarks Conservancy award for its “superb adaptive reuse” of the mansion. non-credited photograph taken by the author. Great posting! Love this building and so nice to see that the "moat" and street level stone balustrade is still in place. Beautiful! Nice post..I really liked the architecture of the building.. Thanks for sharing. I went to Manhattan last year and was impressed with the beautiful beau art buildings. Greeting from Singapore. Does anyone know where to find blueprints (or even simple floor plans) to this fantastic mansion? where did nanaline live the last few years before she died if the new york mansion was given to the new york fine arts?